Exclusive Features of The Elite Magnum. The flagship of the Firemagic line. One of the largest cooking surfaces available in a gas grill today! This grill offers a true 48" across the cooking surface, not the FRAME of the grill like others measure. A total whopping BTU rating of 105,000 on the main cooking surface and two 18,000 BTU rotisserie backburners for a combined total of 141,000 BTU's. The total cooking area is 1056 sq. inches so it can hold just about anything you want to load up! Other features are 3 built-in halogen lights, built-in digital thermometer, timer, & meat probe. 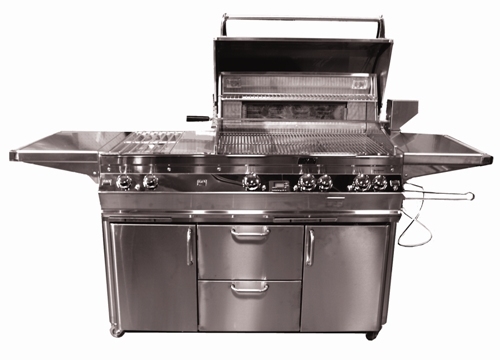 This grill is also equipped for zoned cooking, and features a seperate smoking tray & burner. Another feature is the 110 volt ignition. The stainless steel cabinet cart features dual storage doors below, inside shelves, condiment holders, a stainless steel prep shelf on each end, tank access (propane models) TWO stainless steel drawers and heavy-duty cart casters for ease of portability. The Elite Magnum ALSO includes a super heavy duty rotisserie kit with stainless steel motor capable of turning just about anything you can put on it! Of course, with a rotisserie you also need a backburner and this unit features TWO of them at 18,000 BTU's each, for independent operation allowing you to rotiss AND grill at the same time.Finally, the Elite Magnum cabinet cart model also includes dual side burners @ 15,000 BTU's each of cooking power! THIS unit is truly an outddoor kitchen on wheels! Even the user friendly control panel offers many unique features. Easy, push button 110 volt electric ignition makes lighting your new Firemagic grill a snap. Comfort touch control knobs are easily removed to make the grill more child-proof. Light/Hi/Med-Hi/Med/Med-Lo/Lo positions offer a range of heat settings to cook almost anything.These are great features on the widest line of barbecues to choose from today. All offered by a company that has been building outdoor barbecues for almost 50 years! You know they will be here tomorrow!